Whose Patriots crowd was bigger… President Obama’s or President Trump’s? Yesterday the New England Patriots visited the White House to celebrate their victory with President Trump. 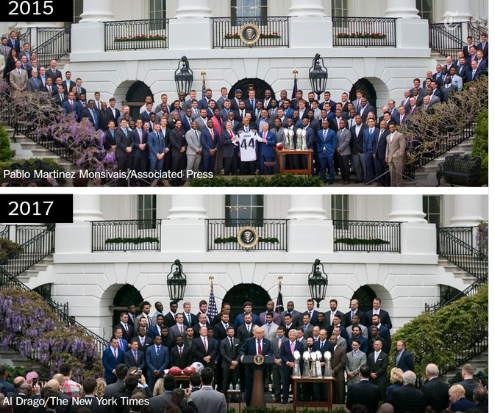 This picture came out showing the difference between the Patriots that visited in 2015 compared to the number that visited yesterday. When will the comparisons stop? We had the picture controversy associated with the Inauguration and now this. The Patriots have said the 2015 picture included the players and the staff whereas yesterday’s picture included the team. Let’s be fair this is an attempt to simply stir the pot. Was Malia Obama smoking spot? Well Malia Obama seems to be smoking something. it might be pot. So what does this say. It says she is an 18 year old making her own decisions. Parents try to instill values and common sense into their children but 18 year olds are responsible for their own decisions. By musesofamom | Posted in Ebony Mom Politics | Also tagged African American, African Americans, Barack Obama, black america, Current Events, Malia Obama, Malia Obama smoking potlia obama, Michelle Obama | Comments Off on Was Malia Obama smoking spot? What do we tell our black children? Two black men shot by police in 2 days. There is something wrong. I was talking to a friend of mine and she asked “what do we tell our children?” We don’t tell them anything we have not already told them. We have told them to be polite, be compliant, say yes sir, keep your hands visible, but they can do all these things and still not survive an encounter with a bad cop. We have no magic words that will ensure their safety. We have no words that will offer a cloak of protection to our husbands and our fathers. When we search for them we are in fact claiming some of the blame for the evil acts sanctioned by the state. When we look at the cases of Alton Sterling and Philandro Castile we are stunned by the actions of the police. The force used to confront non lethal situations is appalling. In the Castile case we saw a policeman unload into a car that had a 4 year old occupant in the back seat. 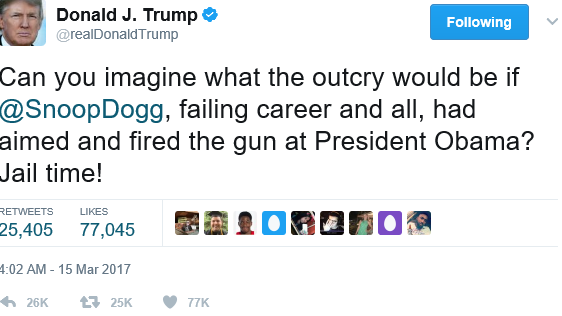 Where is the outrage? We see it in pockets of the global community, but remember the case of the gorilla who was killed when the zookeepers feared he would harm a toddler who had wondered into his enclave. When he was killed the response was fast and furious. Petitions went up calling for the arrest of the mother, one called for her children being removed from her home. The world was mad. Well world get mad again! This is not right and this is not a black problem. Sure our victims are demonized. All their past bad acts are publicized as if that is justification for now. He was a shoplifter as a teen so now that he is 30 and shot by the cops it is ok. No it is not. Even if he were a choirboy that would not matter either. None of this matters. What matters if a policeman shoots a person retrieving identification, selling cds, selling loosies, walking, running, driving or whatever he needs to be responsible for his action. Fearing for his life is not enough it is almost a punchline. So where do we go from here? Really, you tell me. By musesofamom | Posted in Ebony Mom Politics | Also tagged Alton Sterling, Barack Obama, black america, Black People, Current Events, Philandro Castile | Comments Off on What do we tell our black children? Interesting article. Read it and share your thoughts. When did the GOP debates turn into the Fight Club? I used to laugh when I saw video of politicians in other countries fighting. I am talking a, but about physical fighting. I knew that kind of behavior would never happen here, but now I am not so sure. After watching last Thursday’s GOP debate I am starting to think we are one step shy of a physical altercation. One has to wonder how long can grown men call each other names, talk about each other’s mothers, brothers and husband/wives before someone takes a swing at the perpetrator. Are we one step shy of anarchy? When did campaigns turn into reality television? Did it happen with the advent of 24 hour news? We all know that the news channels like any other channel crave ratings and this political cycle is proving to be a ratings boon. The problem is we are talking about the future of the country. Do you remember when members of Congress used to refer to each other as the Distinguished Gentlemen? What happened? When did disrespect become the language of the political class? Over the past 8 years we have seen this anger build to this boiling point. We have heard words hurled at our president that would have never been tolerated but the words were embraced by some and allowed by others. So here we are watching the gladiators go at it and wondering what will we gain from this. Share your thoughts.